На рисунке спрей и бутылочка с губкой. Хотелось получить стрей, а получил бутылку с губкой. Крышка на ней не держится, сваливается. В сумке лежит бутылка с мокрой губкой. В остальном, жидкость, как жидкость, чистит нормально. The new GEWO rubbers' series is now available. The rubber is produced in three hardnesses of sponge, so everyone will find something for himselves. We recommend! The newest DER MATERIALSPEZIALIST blades and rubbers are already available at our store. The products of this German company are an absolute top equipment for players playing pips and anti-spins. New GEWO plastic balls are available now. The balls are made of new ABS material, so they are perfectly round and much more durable. Another advantage of these balls is excellent value for money. We recommend! New slim-fit design and warm Poly-Terry material. With contrasting coloured inserts on the shoulder. TT-shorts made from light polyester material with a plain JOOLA logo. VICTAS Dyna Seven is the new multi-talent among VICTAS' premium blades. Material: Piquet knit 100% polyester, dry fit. Colors: light blue, blue. Durable 2-roll trolley by GEWO in a sporty design. Robust backpack from GEWO made of high quality material. Ideal for sports, school or just as a companion for everyday life. The weight of your blade is important to maintain. Perspiration can cause a handle to become heavier by 5-10 grams within a year. The messenger bag is the perfect everyday companion. It is robust and timeless in design. Made from stretchable cotton spandex material allowing optimum freedom of movement. With side print on the front. Waran II is our solution for players who are seeking for a pips-out rubber with the highest possible acceleration and speed that is not to difficult to control. Actually Waran II even has more control then many slower pips-out rubbers from other brands. The 5-ply GEWO Sensus Powerfeeling offensive blade is ideal for any playing situation. It provides for excellent feedback and enables both controlled topspins and direct attacking shots. Cleaning sponge in synthetic leather. At last a new option for the defender! The Slice 40 CD has been especially produced for the modern defender / all-rounder. Developed for hard pushing and shopping it is also suitable for controlled top spin. The anti-spin rubber 'Dr. Neubauer A-B-S' has set new standards for the block game at the table with smooth antis. This new version A-B-S 2 has been specially trimmed for the use of plastic and ABS balls for maximum effectiveness. This decking (custom made by Friendship for ttdd.de) combines the top rubber of the RITC Friendship 729 with the sponge used by the Friendship 729 FX Super Soft. However, the sponge colors are different and the sponge is on average also a bit softer. We have reworked our offensive inverted rubber GOLIATH SPEED in order to adjust it to the new plastic ball and also to adapt it to the modern attacking game with short strokes. Material: 100% micropolyester, dobby dry fit. Colour: navy blue. Long pimples with a very large interference effect. Sparsely located small pimples to create disturbing effects. Just exellent for the blocks close to the table and the classically defensive game. Everyone is talking about an amazing new weapon for players using long pimple rubbers. We have it! The distance between the individual pimples is significantly greater for the "Feuerstich" than that of others rubbers. 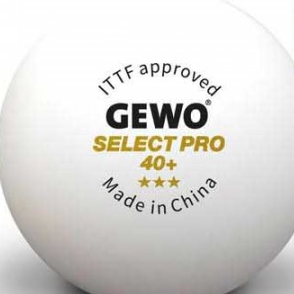 GEWO Double Star SLP 40+ - high-end training ball from GEWO made from seamless poly material. Ideal for club training, multi-ball, and robot training. High-quality, breathable and quick-drying t-shirt. Shorts Lagon made of super light Micro Mesh material. These shorts provide optimum moisture transport and give a sensational light and comfortable wearing comfort. The GEWO hype EL Pro 40.0 is the super-soft rubber in the Hype EL Pro Series. The new sponge / rubber combination was developed for players who want a spin / tempo-oriented style of play with control. Ultra-light, high-quality premium shirt with polo collar made of elastic functional material. Straight, comfortable cut. SPINPARASITE is another milestone in development of frictionless anti spin rubbers. With this rubber der-materialspezialist combined the characteristics control,tempo,disruptive effect and spin reversal to an unprecedented alliance.